MISSION STATEMENT: To welcome, promote, and encourage our community to grow through learning and be empowered through knowledge. To provide the necessary resources to strengthen and support education and lifelong learning opportunities. To uphold the public's right to know by providing equal access to information which reflects all points of view and to provide a safe and welcoming atmosphere to individuals and families. Our 2018 Annual Campaign goal is to raise $6000. 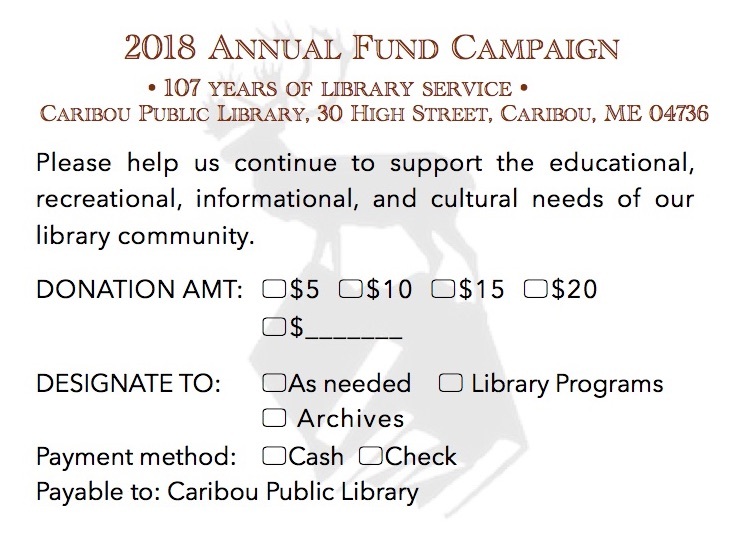 These funds go directly to the library and support a variety of initiatives. You may designate your gift to a specific area if you wish. Please help us continue serving the educational, informational, recreational, and cultural needs of our library community.